Why Join the Knights of Columbus?Learn why Joining the Knights of Columbus will be one of the most rewarding experiences in your life! Come see just what we are all about and take the first steps to enhance your personal life by viewing the video or the Overview Booklet. 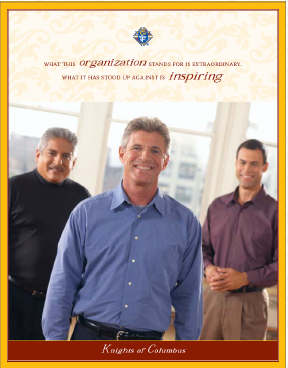 Our eight-page Overview Booklet gives additional information about what it means to be a member of the Knights of Columbus. What this Organization stands for is extraordinary. What it has stood up against is Inspiring. Interested in joining? Complete our online form and a member of the Knights of Columbus in your area will contact you about your membership.